An electrochemical detection system for an isothermal DNA amplification method using an ion-selective electrode (ISE) was developed as a low-cost, simple and real-time monitoring system. The system is based on potentiometry using an ethidium ion (Et+) selective electrode that relies on monitoring DNA amplification by measuring potential changes in the reaction solution containing ethidium bromide (EtBr) as an intercalator to DNA. With progressing primer generation-rolling circle amplification (PG-RCA) under isothermal condition at 37°C, EtBr is bound to the newly formed DNA, resulting in a lowered free EtBr concentration in the sample solution. 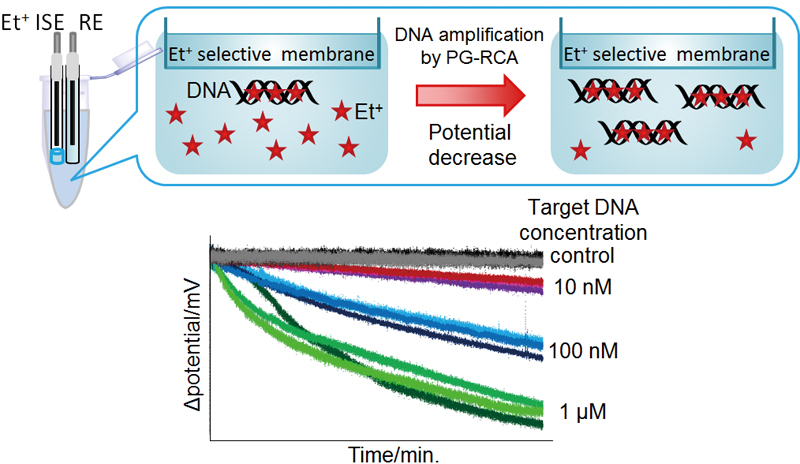 In this case, the Et+ ISE potential allows real-time monitoring of the PG-RCA reaction in the range of 10 nM – 1 μM initial target DNA.